Another heads up, gang, about the coolest event of the summer of ’15, which kicks off today. Turner Classic Movies has turned over Fridays in June and July to film noir. That’s all Friday, every Friday, for twenty-four hours each day. 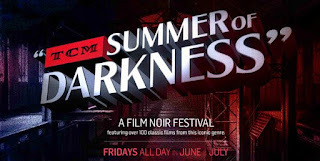 TCM is calling this bonanza the Summer of Darkness, and made the very wise decision of naming your friend and mine Eddie Muller, honcho of the Film Noir Foundation, as your prime time host. Regular readers know the FNF is an outfit near and dear to my heart. I’m the co-managing editor of the Foundation’s magazine Noir City, as well as a columnist and contributor. So naturally I’m thrilled to see our charismatic kingpin taking to the air. TCM has pulled out all the stops, setting up a gorgeous website for the entire festival and starting a free online course on film noir in conjunction with Ball State University. As for programming tips, Eddie kicks things off at 8 PM EST/5 PM PST tonight with Nora Prentiss, a movie yours truly considered in detail for Noir City. The must-see is the world television premiere of the FNF’s restoration of Woman on the Run (1950) tonight at 10:15 PM EST/7:15 PM PST. A second FNF restoration, of 1949’s Too Late for Tears, debuts on July 17. Honestly, you want my advice? Turn on TCM every Friday for the next nine weeks and leave it on. Get yourself an education.